Tom Writes . . .
June 22 and 23 – Jones Road to Webber Dam. Eagle, Michigan, to the boondocks between Portland and Lyons. We paddled two days in a row. First time we have been on the river since December 1, last year. Wow! Physically demanding, like the first two days of Spring Training. Our shoulders ached, but that was not the worst. The worst had to do with our rear ends, sitting in those hard canoe seats for the first time in six and a half months. Yikes! We made it, though, and today, you will be glad to hear, both our exquisite butts are much recovered. We put the Billie V. into the river at the exact spot where we pulled her out last year. No red berries now, as we saw before, just bushes, green now. The river was high; the current was swift. Great paddling conditions. High blue sky with white clouds and sunshine. Hallelujah! We saw cardinals twice. Joe said the cardinals were a manifestation of our mother, journeying with us. I thought, No. She probably would come as a rarer pretty bird, maybe a Cedar Waxwing or an Indigo Bunting. Anyway, the river shallows out as one reaches Portland. An evil tornado destroyed Portland, Michigan, three years ago, but they have rebuilt in a glorious way. Portland is a nifty river town. The Looking Glass River enters, right bank. Portland has a dam on its north end. Downstream, the river turns into a lake, down to the Webber Dam. Nice lake, but no real current. We canoe-ists get no help from the river. We made it, though.. Herons along the way cheered us forward. Bald Eagle sightings as well. Joe thought he captured a Bald Eagle on the GoPro camera but he did not. The Grand shy of Portland, while we had some help from the current. If you enjoy our blog please share it with a friend. We are also on Facebook at Length of the Grand. You may leave a comment here on our blog or contact us by email as follows. 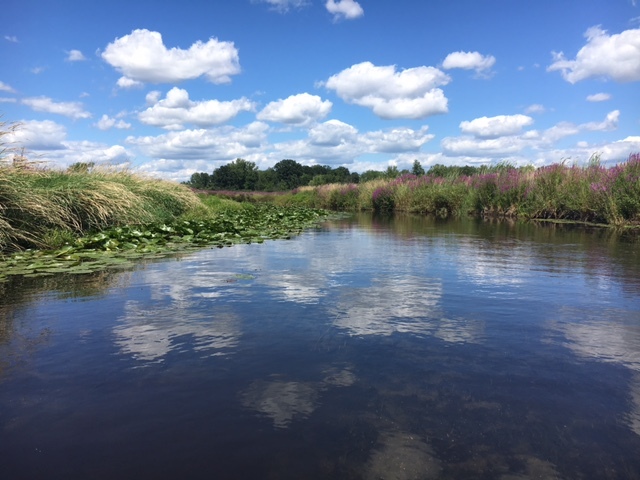 This entry was posted in Environment, Michigan, rivers, Uncategorized and tagged brothers, canoe, Grand River, Looking Glass River, Lyons MI, paddle, Portland MI. Bookmark the permalink. Reblogged this on The Cedar Journal.